If you thought Christopher Nolan’s new film depicting the British evacuation of Dunkirk in World War II just another dull period piece, think again and please go see it. As its title suggests, it is 1940 and Britain’s Army of 400,000 men are trapped in France following the German Blitzkrieg breakthrough of the French Army at Sedan. If those men don’t get off that beach in numbers the war most probably will be lost, and a whole lot of people over here in the States are going to be shouting Zieg Heil! And they are not Trump supporters. The film caters to British nationalism of course but why not? It is one of the most magnificent miracles of history wrought by every soldier and sailor who was there; Women too. Fionn Whitehead gives a strong performance as the character “Tommy,” literally the symbolic stand-in for the hundreds of thousands of Tommies as British Army soldiers are known. He runs for his life in the streets of Dunkirk, a lone survivor from his squad in a friendly fire incident with French soldiers holding a position. He walks minus tin hat and rifle onto the beach at Dunkirk, just where a summer resort used to be, relieves himself, and notices a man burying a soldier nearby. Then we are off into an action packed kaleidoscope of what is as close to a depiction of what it was like to be caught up in something that is trying to kill you at every turn can be. 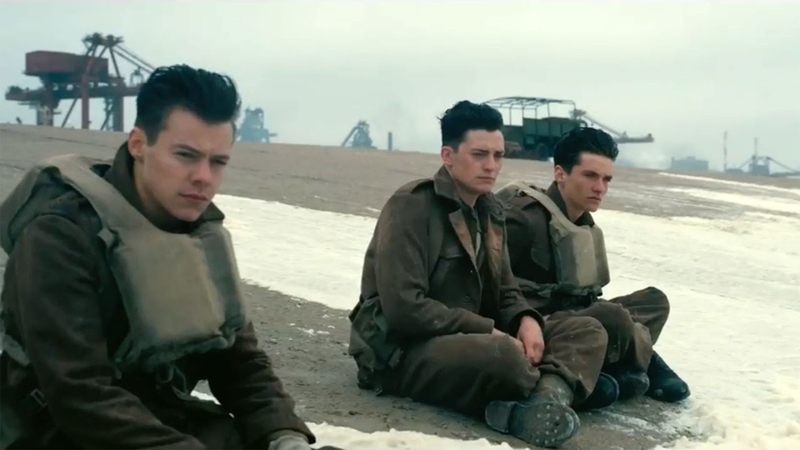 Pop star Harry Styles is superb as another soldier named Alex. His conflicting emotions at what he sees and experiences are a delight some critics were not expecting to see. It is a cynical soldier we see in him, but one just as determined to survive. What Nolan does so incredibly well is to make the chaos on the beaches, in the air, and at sea intelligible to us by going continually back to three groups of characters and slicing up each horrifying moment of survival with such skillful film editing that concerns about following it all begin to fade as the film progresses. The sound editing is going to win this film an Oscar as you hear everything as if you are there. I had to dodge a couple of times in my seat it was so well done. This film demands to be seen in a big screen high quality sound environment. So find one of those ultra-screens if you can. The cinematography is just as good so here another Oscar opportunity is likely to fall this film’s way. Experienced actor Mark Rylance leads his son and a friend in one of the “Little Ships” sent across the Channel to fetch as many men from the beaches as possible. His stern and steady civilian patriotism and real love for others comes at us head on and it is appealing. One thing the film did for history is to include about a dozen of the real “Little Ships” still with us today after many refits recreating what they did so long ago. Kenneth Branagh provides continued excellence in depicting the British commander landed on the pier who has to figure out how to get more men off the beaches faster to prevent complete disaster. He delivers both stirring lines and snarky but welcome lines to fit the hell everyone’s in. James D’ Arcy is an Army Colonel who helps Branagh with sorting out the confusion and plays it well. If you want tense aerial combat with pilots figuring their remaining fuel over Dunkirk, and finding it will be fumes when they get back to Dover you’ve got it here. And yes there are those wonderful Rolls Royce Merlin engines and three Spits (Spitfire fighters) to bring us there. The returns to the second by second combat between the fighters and a real Heinkel bomber from the War, a mine sweeper, and Rylance’s “Little Boat” are some of the most arresting drama of the entire film. Historic authenticity is extremely compelling as Nolan bothered to speak to the few remaining veterans who were there. Extensive research was done as well. And yes, some men went mad and just as one soldier was seen and heard to do try to walk to England out into the waves. And yes, the Spitfire that flies an incredible way after it runs out of fuel is accurate, as a skilled pilot could glide the craft for miles under the right conditions. That moment in the film allows us to see it all from the air in silence, as the winds carry the plane where they will. The film score is by Hans Zimmer, based on a theme of an Elgar piece. It weaves its way into the film and into a place inside you that it too may be up for an Oscar for best film score. It permeates everything in the film. This is a lovely film bringing us to such human drama in so many ways skilled and amazing that you must see it. Don’t stay at home pouting cynically. Experience it. This entry was posted in Essays and tagged 1940, Christopher Nolan, Dunkirk, Dunkirk Evacuation, Dunkirk Rilm Revie, Dunkirk Stunning Depiction, Film, Film Review, Harry Styles, Kenneth Brannagh, Mark Rylance. Bookmark the permalink.